I highly recommend you read this book, especially if you are going though a tough or difficult period. When I got laid off for the second time in two years (thanks to a bad economy & my big mouth) I had a lot of time on my hands. So I decided to read all those “important” books that you always mean to read but never had “time” for. I picked up a copy of Man’s search for meaning in a used book store. This is book is full of very dark humor (not surprisingly) and profoundly disturbing images, since Dr. Frankl was a survivor of a WII concentration camp. if people who were imprisoned with no hope of escape or rescue from their imprisonment and who were facing certain death – could survive …how can I NOT survive being without money or a job? In the book, one passage struck me forcefully when Dr. Frankl said that his experiences were not like a normal prison term because even criminals KNEW what would eventually happen to them. They either were released or in the case of lifers, die in prison or are executed. Frankl said the closest condition he could compare those feelings he had while in the camps was to that was of being unemployed for a long period of time! Imagine my surprise, I understood exactly what he meant – The constant uncertainty, grinding stress, the lost of hope, (and yes hope eventually seems to die under prolonged stress) and the dulling of your fears and terrors followed by either acceptance or despair. Fear makes you either want to either fight or flight but you can’t run away from a bad economy nor can you effectively fight it, so you either sink into depression (addiction) or accept what is happening to you. But with acceptance you must find your true “meaning”, your real life’s work in order to continue surviving. 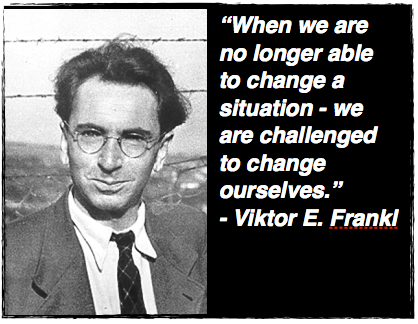 This is what Frankl meant by man’s search for meaning – what do you REALLY have to live for? For him it was the prospect of seeing his wife again (at first) and later on telling his story of the camps. For one man it was saving a bit of paper with a half-finished math equation on it to share with other scientists. For some it was music or singing or acting as healers/medics for other prisoners. Sidebar: when I was in the Army, I was told a story about how a US POW who played piano, “practiced” playing everyday while in captivity using scape paper and rocks for keys. After his release he returned home, played a difficult concerto he could never master before perfectly! Meaning in a life doesn’t have to be a lot, simply holding on to something that is greater than yourself. For me it’s has been using my marketing skills to help small business people and families make it another year in tough times. Social Media for Small Business – Paid, Earned or Owned?